Always consider electrical safety during an outage. Consider all fallen wires dangerous. Wires can be energized even if they appear to be safe, and even if the surrounding area does not have power. Stay away from all downed wires. Use generators properly; improper connection of a generator could put our linemen at risk. Never use a charcoal or gas grill to cook inside your home or garage; carbon monoxide can build up in your home and become deadly. The FDA Center for Food Safety and Applied Nutrition has tips concerning refrigerated and frozen food safety after a prolonged outage. Create an emergency kit that contains items such as water, food, a battery powered radio, flashlight, first aid kit, and more. Ready.Gov offers examples. Download our MyMEC App to report outages. Search for Menard Outage in the Google Play or iOS App store to download. You'll need the account number (found on your bill) or meter number (located on your meter under the barcode and above the logo) to register your account. You can also report an outage online through our Outage Center, or call the office anytime at 800.872.1203. If you use a standby generator, a single transfer switch or relay of adequate capacity must be installed so that our equipment cannot become energized by the standby unit under any conditions. This should be a double throw switch or relay that may be manually or automatically operated. The transfer switch must be installed in accordance with the National Electric Code, National Electrical Safety Code and our wiring specifications and recommendations. You must return this Standby Generation Application to our engineering department. Please contact them at 800.872.1203 for questions or further details. 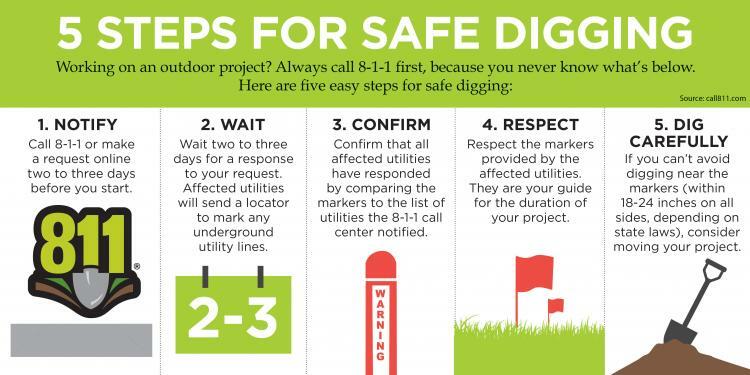 It is the law in Illinois to notify JULIE at their website www.illinois1call.com or by calling 8-1-1 at least 48 hours before you dig, no matter the size of the project or how deep you dig. The call and services are free. JULIE does not mark any non-utility or privately installed lines such as water and sewer lines from the street to the house or electric and telephone lines from the meter/house to a garage or shed. Note that lines may be positioned within 18 inches on either side of a marked line - use extreme care, which may require hand digging, within this zone. Please note that the locating company USIC will mark all of Menard Electric's lines. We do not mark lines for members. You must call JULIE. Utility lines are marked using a color code. Red-Electric; Yellow-Gas; Orange-Communications; Blue-Water; Green-Sewer. See more at the website. As a member of the Energy Education Council we are a supporter of the Safe Electricity website. Visit the site to read and view numerous articles and videos concerning home, job and farm electrical safety.